Latest generation 18V XR Li-Ion Brushless technology Brushless motor is designed to achieve up to 57% more runtime compared to brushed motors. The brushes on a conventional motor cause friction which in turn generates heat and slows the motor down. The brushless technology electronically transfers energy within the tool which allows a longer run time between charges This XR Dewalt 9 Piece Kit, contains the following: DeWalt DCD796N 18v XR Brushless Combi Drill DeWalt DCF887N 18v XR Brushless 3 Speed Impact Driver DeWalt DCG412N 18v XR 125mm Angle Grinder DeWalt DCL050N 18v XR Handheld Area LED Torch/Light DeWalt DCS391N 18v XR Li-ion 165mm Circular Saw DeWalt DCS331N 18v XR Li-Ion Jigsaw DeWalt DCS355N 18v XR Brushless Oscillating Multi Tool DeWalt DCS380N XR Saw . DEWALT 18V XR 9 PIECE KIT WITH 5 X 5.0AH LI-ION BATTERIES & 2 X TOUGH SYSTEM BOXES (DCD996/DCF887/DCS331/DCS391/DCG412/DCL040/DCS380/DCH273/DCS355/DS300). 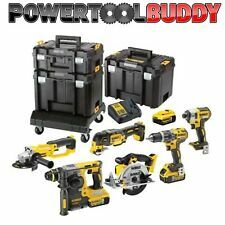 DEWALT 18V 5.0AH LI-ION 9 PIECE KIT. Kit includes. Dewalt XR 18v 6 Piece Brushless Kit 3 x 5.0Ah Li-Ion Batteries Charger Bag Stock Code: DCK6BLKIT1 Latest generation 18V XR Li-Ion Brushless technology - Find out more about Dewalts new 5.0ah technology. Brushless motor is designed to achieve up to 57% more runtime compared to brushed motors. The brushes on a conventional motor cause friction which in turn generates heat and slows the motor down. 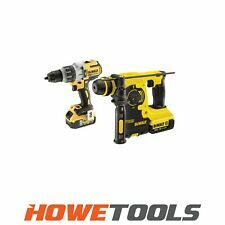 The brushless technology electronically transfers energy within the tool which allows a longer run time between charges This XR Dewalt 6 Piece Kit, contains the following: DCD796N XR Brushless Combi Hammer Drill DCF887N XR Brushless Impact Driver DCG405N XR Brushless Grinder DCP580N XR Brushless Planer DCS391N XR Circular Saw DCS331N XR Jigsaw 3 X DCB184 5.0ah Batteries 1 X .
Dewalt XR 18v 7 Piece Brushless Kit 3 x 5.0Ah Li-Ion Batteries Charger Bag Stock Code: DCK7BLKIT2 Latest generation 18V XR Li-Ion Brushless technology - Find out more about Dewalts new 5.0ah technology. Brushless motor is designed to achieve up to 57% more runtime compared to brushed motors. The brushes on a conventional motor cause friction which in turn generates heat and slows the motor down. The brushless technology electronically transfers energy within the tool which allows a longer run time between charges This XR Dewalt 7 Piece Kit, contains the following: DCD796N XR Brushless Combi Hammer Drill DCF887N XR Brushless Impact Driver DCG405N XR Brushless Grinder DCP580N XR Brushless Planer DCS391N XR Circular Saw DCS331N XR Jigsaw DCH253N XR SDS Plus Hammer Drill 3 X. 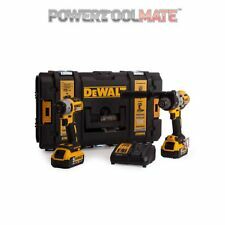 New listingDeWALT DCZ298C2 1.3Ah 18v Lithium Ion Cordless + Impact Drill Set - BNIB . This kit contains the latest DCD996N combi drill. Brand new, unopened. Check my feedback and buy with confidence. Condition is New. 1 x 18V DCF885M2 XR Compact Impact Driver has an ultra-compact, lightweight design for use in confined spaces. It has an improved ergonomic design and rubber grip, for increased comfort. 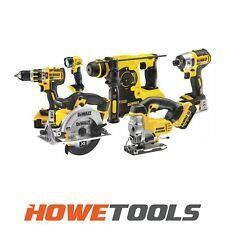 Dewalt Jigsaw And Circular Saw 18v Twin pack Heavy duty set. Jigsaw works Circular saw works Charger works Battery works (Case works?) 18v Cost millions when new Ile send it tracked and signed for Thanks for looking. Max Torque 155Nm, No Load speed 2800rpm & Impact per Minute 3200ipm. Max Torque 42Nm, No Load Speed 0-450/1500rpm, Beats per Minute 0-7650/25500bpm. 18V XR Li-Ion Brushless Compact Drill Driver. 18V XR Li-Ion Brushless Compact Imapct Driver. DeWALT DCD7777 Brushless Drill Driver. DeWALT DCF787 Brushless Impact Driver. DeWALT T-STAK Kitbox. DCD777 Drill Driver Features. Dewalt nail gun 18v 2 fix. Condition is Used. Comes with 1 battery and 240v charger Haven’t used it for about a year so it may need a service I’ve gave the battery a charge and everything worked fine Uk bidders only please. 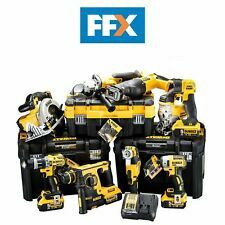 The DEWALT DCK665P3T XR Compact Wood Working Kit, contains the following DeWalt XR 18V Cordless and Brushless WoodworkerDCK665P3T 5.0ah 6 Piece Kit. Selection of Six DeWalt Tools. 1 x 18 Volt DCS331 XR Premium Jigsaw is designed for efficiency and has a powerful and highly efficient DEWALT PM47 fan-cooled motor with replaceable brushes. This is achieved through 3 motor speeds and torque settings. It has a super lightweight and compact design. No Load Speed: 0-550/0-2,000/min. No Load Speed: 0-850/0-2,100/0-3,000/min. Battery Chemistry: Li-Ion. This Combi drill is ultra compact and lightweight design allows use in confined spaces. Fitted with a high power, brushless motor that is capable of outputting up to 205Nm of torque, ensuring heavy applications are completed quickly. DeWalt DCK264P2 18v XR Li-Ion Cordless Brushless Nailer Pack -2x 5.0Ah Batteries. Condition is New. Dispatched with Royal Mail 2nd Class. Upgrade your DIY toolkit with DEWALT 18V power tool combo kits and packs. These handy kits come with all you need to get working at home or in the workplace. From simple two-piece kits to those with nine items, you'll find the ideal power tools for any application. Perfect for adding the finishing touches to your toolkit, or for those who need fewer items, two tool DEWALT 18V combo kits give you the perfect starting point, like something with a compact hammer drill and impact driver. A DEWALT DCD796 hammer drill is a compact unit made with a lightweight design, perfect for a range of applications. An ergonomic design paired with an intelligent trigger design ensures that you always have full control over this power tool. This set also comes with a DCF887. This DEWALT impact driver features a three-mode impact selector for increased control whilst a bright LED halo ring light improves visibility in low light situations. This kit comes with two 5Ah batteries, a charger and a Tstak case, offering everything you need to get working. Go for a four tool DEWALT 18V combo kit for something with a varied range of applications, ideal for those looking to start their DIY toolkit. You'll find kits with a varied range of different tools available, ensuring that there's something for everyone. A set with a combi drill, impact driver, circular saw and jigsaw opens up your DIY capabilities. The circular saw features an ergonomic handle with a rubber grip for increased comfort and manoeuvrability whilst a lock off switch offers better control and safety. 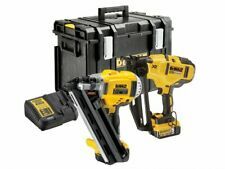 The DEWALT jigsaw features a fan-cooled motor that offers amazingly fast cutting of up to 3000 strokes per minute and a modular design for easy servicing.